SO what does it take for me to put the monthly schedule together? 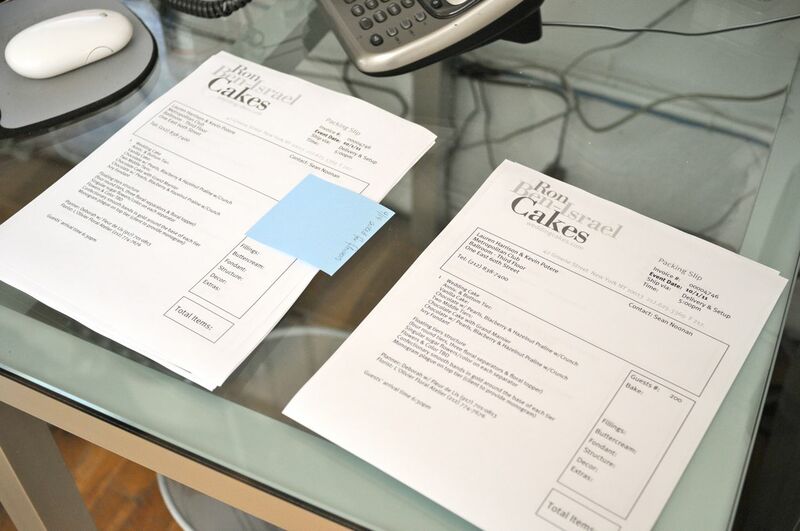 After Ron meets with the client and we come up with a contract describing the cake flavors and design, it’s then my responsibility to make sure that all of the small details that were discussed during the client meeting are followed up on. (Typically I like to have this done almost a month before.) Phone calls and emails are exchanged with our clients’; notes are made on there contracts and updated in the computer. 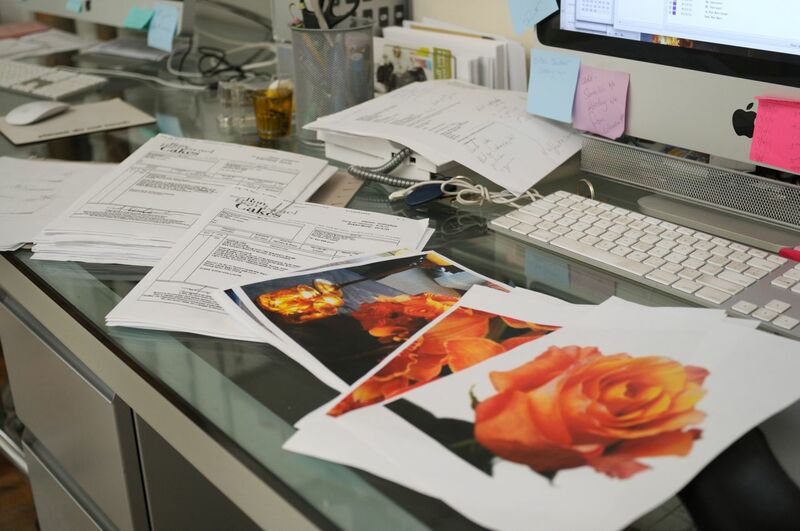 Putting the client's details together. When it’s time to put the month together, I need a lot of desk space. I grab the month’s folder and I start at the very beginning. (What am I in the Sound of Music?) I go through again reading each contract making sure that all of the details have been collected, if not yet received another quick email or phone call goes out. I print the clients packing slip (contract) for the production team and all of the inspirational materials I have on file for them get attached to the slip. Two piles of packing slips are made, one for the kitchen and one for the production room. I put sticky notes on each of them letting them know when specific pieces of information have been requested and when they can expect it. This gets done for every client until I am done the month. We always have last minute projects so they get tucked in throughout the rest of the month. 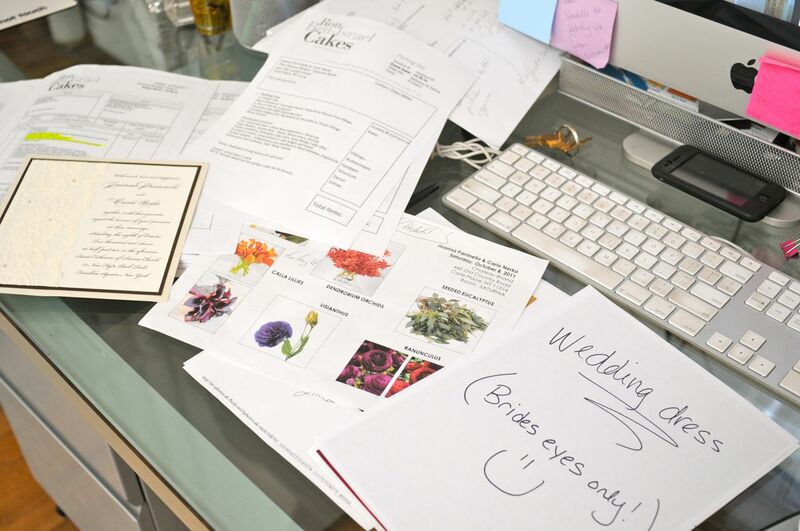 The packing slips then get handed off to the production team and they start going through them to make sure they are clear on design, flowers and sugar objects that need to be made and if ingredients need to be ordered. Putting my packing slips together. But I am not done yet. Now I have to create a schedule for the staff to reference for the month. This includes where the cake is going to and who on staff is making the deliveries. I also have to figure out the succession of deliveries and what time things are being picked up and dropped off. This is a really fun task when you have 9 cakes going out in one day. It’s the staff’s timeline to reference in case they have questions regarding deliveries. Almost finished…Once the staff schedule is finished, I then have to enter it in to our driver’s deliver schedule making sure that all the proper time are represented and the addresses are correct. I do use the digital ones too, but can’t let got the actual stuff! You post is very informative and a standard for any aspiring P.A. to a cake baker or in any profession. You deserve to have your own interns!!! !